This is how you use whatever vegetables you have left in the refrigerator before they go bad. If you don’t have a lot or no time to make the soup, chop them into bite sized pieces then dump them into a freezer bag and mark it soup veggies. I make home made chicken and beef bone broth so I have it on hand often. If you don’t then get the organic type if you can, if not regular will work. It may not be as red as the picture, but if you like a tomato base add a small can of tomato sauce to it, fresh herbs, garlic, etc. for added flavor. I brink the stock to a boil and then throw in chopped bite sized pieces of celery, carrots, onion, tomato, green beans, broccoli, zucchini, bell pepper, butternut squash, etc. 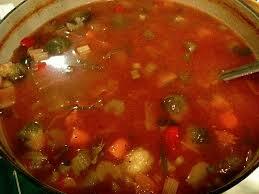 let it boil about 5 minutes if the veggies are fresh and you like them firm, longer if you like them a bit softer. If they are frozen, then wait long enough for them to thaw and cook a bit. Hey that’s it! Soup in about 15- 20 minutes and it’s delicious! If you’d like to put all of this into a crock pot on low for 4-5 hours or high for 3 hours it’s even better.